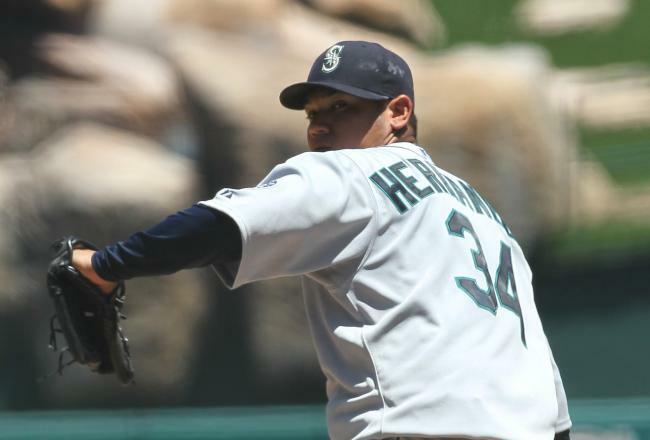 With the temperatures over 100 degrees at Kauffman Stadium today, there was a bit of wonder about Felix Hernandez and whether or not he would hold up in the immense heat. Well, after 8 innings pitched and only 89 pitches thrown Felix was headed to the clubhouse in route to his 8th victory of the season. Felix did not dominate as usual, striking out just 3 hitters, he just pitched smart and allowed hitters to get themselves out. The Mariners offense got on the board early when Jesus Montero hit a line drive to center field that looked as though it were going to be caught but kept going and going until it left the yard. Center fielder Jarrod Dyson almost left with it as he crashed into the wall assuming he still had room to run. Kyle Seager and Justin Smoak both singled and were sacrificed up 90 feet on a John Jaso bunt. With two runners in scoring poition, Michael Saunders singled to right to score Seager and Smoak moved up to third. Brendan Ryan did his job, hitting the ball deep enough to right field to pick up Smoak on the sacrifice fly and the M's led 3 to 0. In the fifth, Ichiro Suzuki doubled and moved to third on a wild pitch. Casper Wells walked and then it was Jesus Montero's turn again at the plate. Montero hit a single through the hole between third and short that scored Ichiro from 3rd and made Montero look like the best player in baseball. M's 4, Royals 0. The Royals got a run off of Felix in the bottom of the 5th inning, but it was all Mariners the rest of the way. In fact, it was all Montero the rest of the way. In the top of the 7th, after another Casper Wells walk, Montero smashed a ball to left field that went off the very top of the wall, inches from a homerun as Wells scooted all the way around to score and Montero glided into second with a double. He wasn't done yet! In the top of the 9th, with Dustin Ackley at third base, Montero hit a sac fly and drove in his 4th RBI of the day. That's right, 4 of the 6 Mariner runs were hit off the bat of Montero. For the series, Montero is 10 for 17. That's a .588 average. He's walked twice for a .632 OBP and has 8 RBI and 5 Runs Scored in this series alone. The only Mariners not to get a hit today were Casper Wells and Brendan Ryan, but Wells walked twice and scored and Ryan hit a sac fly for an RBI. Not a bad showing for the team once again. If anyone has an argument that sunshine doesn't make a difference, look at the Mariners. Kauffman Stadium is actually larger than Safeco Field and the Mariners don't seem to have any trouble here. They scored a total of 31 runs in the 4 game series and looked like they could be one of the best teams in the Major Leagues. If we could bottle some of this hitting and carry it back to Seattle, we would be one of the better teams in baseball, but, we can't and we aren't. Now the M's are headed to Florida to face the Tampa Bay Rays in a lovely indoor facility. The ball travels just fine and it should be a great series. Tampa Bay is a better ball club with a lot more on the line, I don't think they'll be throwing any AAA pitchers at us. Either way, it's my bet that the Mariners continue to hit on the road.